Verbatim a popular and old digital storage company launched its new series of SDXC memory cards. SDXC is the new standard in the storage industry which came up earlier this year. SDXC stands for Secure Digital Extended Capacity. What SDXC means for you is bigger memory card sizes and faster data transfer rates which is becoming increasingly important with our versatile usage of digital media. >Ready for use in the new with SDXC host products. >Class 10 means it offers higher data speeds. >Compatible with Windows7, Vista, XP. >Makes use of the the New exFAT file system. >Large 64GB of storage space. These cards are now available at a price of 289 Euro which is costly. Its good to see the SDXC format catching up. As more and more companies add up to this format we will see fall in prices. 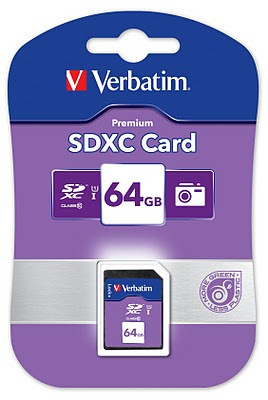 SDXC memory cards can be used only with SDXC host products so dont buy it if you dont have a compatible device you will end up returning it to the shop again. If you put a SDXC memory card in a non compliant device please DO NOT format it when you face an error message urging you to format it, press cancel. If you do that the card will no longer be SDXC! If you want to use an SDXC card in the older SD slot on your PC/card Slot, you need to install SDXC compatible driver for that SD slot. And please use the SD Formatter 3.0 to format your card for best results. There are chances the card may no longer work with SDXC compatible devices if you end up formatting it with windows formatter which uses FAT format.